Note from Jim - I'd like to introduce a new feature today to the FBU called Bronze Age Spotlight written by FBU friend Trey Causey. Trey has some really interesting insights into the Bronze Age that I thought you might enjoy, so he has graciously agreed to share them with us. I hope you enjoy it! Let's just say I know my audience. Jim Shelley is a Woodgod fanatic, for reasons which will likely forever be obscure. So when Jim asked me to scribble something down periodically on characters of the Bronze Age to feed the hungry maw that is his blog --well, Woodgod would have to come first. Let's get the basic facts. The man-brute (as he is called on the cover) known as Woodgod first appears in Marvel Premiere #31 in 1976--a title which also featured Alice Cooper (#50), so we may fairly call it eclectic. Woodgod is the creation of Bill Mantlo who gave us a lot of pure, uncut Bronze Age (and near post-Bronze Age) product--The Micronauts, Rom, Cloak & Dagger, Jack of Hearts, and Rocket Racoon. I defy any real comics fan to NOT find something that hits their undiluted comics sweetspot among Manto's ouevre. Can't be done. Now Woodgod also springs from the able hand of Kieth Giffen, who has given us a lot of good comics as well, but mostly post-Bronze Age. Woodgod, though, has that telltale Mantlo glow. So Woodgod is a gentically engineered supercreature made in New Mexico. 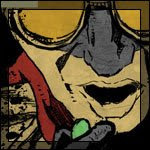 Frankensteinian in origin, and cloven-hooved to boot, he sends townsfolk into a violent frenzy of ignorance (as man-made creatures have a habit of doing) and they accidentally release some nerve gas that kills his creators--and themselves. 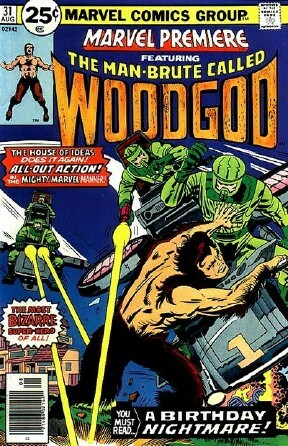 After fighting the army with the Hulk and Spider-Man, Woodgod eventually winds up in the Colorado Rockies. He begins practicing self-taught genetic engineering (he's a quick study) and creates some other half-animals to frolic with called the Changelings. Where'd Mantlo get the inspiration for this? Well, the most obvious source is mythology since Woodgod resembles a satyr, or the Greek god Pan. His name even makes that explicit since nothing else is particularly godlike about him. Pan is traditionally the "god of wild places", which is almost a recapitulation of Woodgod's name. The leadership of the changelings (the name traditionally given to fairies left to replace stolen children) ties in with this theme as well. Pan is typically associated with the Horned Man or Horned God, one of the putative ancient deities of the pan-European witchcraft cult hypothesized by Margaret Murray's Witchcraft in Western Europe (1921)--which is really interesting if one doesn't let pesky things like historical fact get in the way of wild-eyed speculation, which Murray certainly didn't. 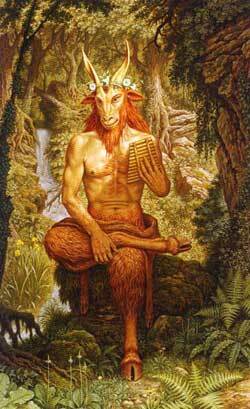 In any case, Cernunnos, fertility god of the continental Celts, is also horned. It's a common motif, whatever its origin. The real meat of Woodgod's origin, though--genetic engineering and all that--seems weird for a character that's a shoutout to Greek myth, when Hercules and Venus are running around the Marvel Universe. No, I think the biggest inspiration must have been the Goatman. 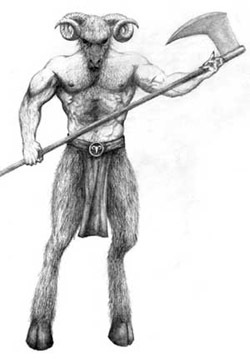 The "Goatman" is a legend or cryptid (take your pick) originally reported in Maryland, but eventually sighted in a lot of places, some even in Colorado. The Goatman was first reported in 1957, but the story really takes off in the seventies. Certainly by this point, if not before, the legend is of the typical "lover's lane" variety. You've heard 'em, I'm sure--teens making out are menanced by a killer or monster of some sort. In this case, a satyr with an axe--which always struck me as an odd detail--why the axe? Anyway, besides the axe, the other interesting tidbit about Goatman is that he comes with an honest-to-goodness origin story! Supposedly, the creature is the product of secret government genetic experiments--either as unholy creation (Frakenstein again) or tragic accident (Bruce Banner-style). See how the hoofprints begin to bear a resemblance to our man-brute hero? Before this trail emerges from the woods, let's try to put these divergent paths together. We've got ancient gods with cloven hooves that represent the wilderness--and procreation. The Goatman and Woodgod are tied to the wilderness, and procreation as well, through their links to genetic engineering. The Goatman, unlike his hooved brethen, is a double cautionary tale--not only is he made by man playing god, but he menaces teens with procreation on their minds. He's The Horned God inverted. How about Woodgod? 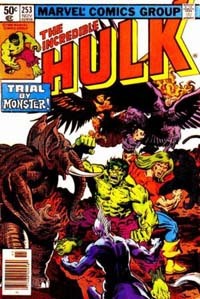 He proves his fertility (and his ancient connections) by learning the genetic arts and birthing children of his own, the Changelings in the pages of the Hulk. Woodgod expressly wishes his changelings to become better than humanity--symbolically replacing them like their namesake fairies literally replace human infants. You know, Woodgod's progenitor Pan was often accompanied by Priapus, a minor god with a permanent erection...I wonder how Bill Mantlo would've tackled that within the Comics Code? Already.... I can hear the internet crack in two. If there is one name that gets a passionate reaction all over the NET.... it is "Rob Liefeld".... although I would say that John Byrne is a close second. There are those who LOVE his work and everything he does...... and there are those who HATE him with a passion that you would think that Rob spat in their Grand-ma's face or something. I guess I am one of the few who love some of what Rob did.... and who is "meh" with some of what he did. So lets focus on what Rob did that I love. Although I am sure that many will point out that Karl Kesel probably did a lot to improve Rob's work on that book. Yes the combination of Rob's work with Karl's work was pure magic. But say what you will... without Rob.... there would have been no "combination". No "magic". One thing you can say about Rob's work on Hawk & Dove is that when a character grinned.... he GRINNED. And when Rob was drawing and evil character.... he REALLY looked EEEEEVILLLLL!! Loved his portrayal of Kestrel. And later, when I saw the "What If" issue featuring Wolverine.... once again it made me a fan. Once again... yes I am sure that Scott Williams did a good job inking Rob's work. But once again.. no Rob.... no work to ink. And again.... no matter what many may say about Rob's work and how much they hate it.... there is one thing that no one can deny - Rob took New Mutants, Marvel's worst selling title at the time, and he turned it around into one of it's top seller. And it sold even more when it became X-Force. But still what he did is quite a feat that many were not able to match. I can understand that there are many creators who feel that they are infinitely more talented then Rob. That they must think that if Rob is a millionaire.... so should they since "they are much more talented then Rob". Even if that was true... things do not work like that. No one can predict success (will have to make a Blog about that someday ;) ). Many may have realised that when they launched their creator owned comic and expected it to sell at least as well, if not more, then Youngblood did.... . when they expected to become millionaires. Imagine their dissapointment when it did not do so. Heck some of them not only did not become millionaires.... but they almost lost their shirt with their creator owned comic. All one can do is make the best work he can.... and hope that people like what they did. That's what Rob did... and good for him.... New Mutant became a commercial success. And the rest is pretty much history. In which our hero gets an unpleasant surprise. 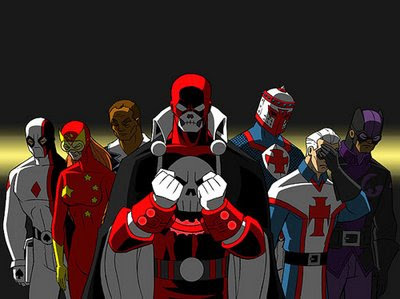 With todays free comics, I am also going to preview two character designs Pierre has worked up for our Trial of the Red Death comic. These characters will be appearing as small cameos in the comic. 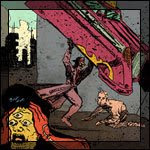 And an issue of Crack Comics featuring the Black Condor. Do you suffer from reading comic book floppies? 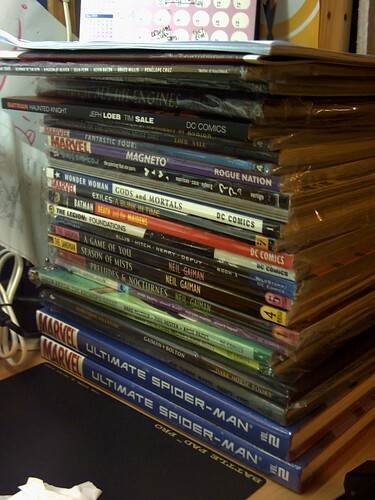 Are you surrounded by stacks, or piles, or teetering towers of comic books? 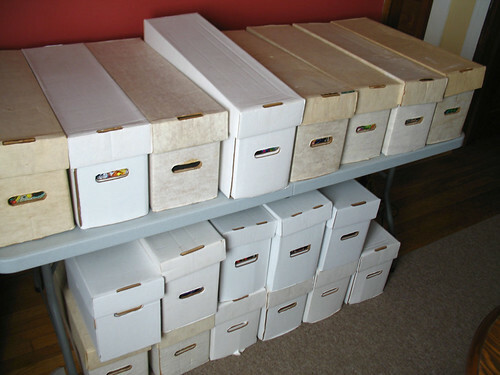 you will store the comics you buy, then actually reading and enjoying your comics? Does your office or other personal space look like this? Maybe you've got it all figured out, and your space only looks this bad. Regardless of what kind of hardships or mishaps you may have had with comic book flopies in the past we here at the Paper Comics Deathwatch want to assure you that your worries, storage problems, and fear of safety hazards are over now. I saw your recent post about the new/old Diamond policies and I would like to confirm that these new policies are indeed true and confirm that they will have a chilling effect on the business as we know it. So, to the brass tacks, the thing that slaps us up in the face most is the raising of the Purchase Order benchmark to $2500. What that means is that every book needs to generate $2500 of revenue (that would mean a little over $6000 in sales at retail based on the discount we give to Diamond) in order to be listed with Diamond. That does not mean that Diamond is going to cancel or not carry books which appear in the Previews but do not reach that benchmark, but it does mean that if you have a line of books which consistently do not meet that mark, you will not be getting your books listed in the Previews for long. Diamond, the undisputed ruler of direct market distribution, asks vendors to meet two sets of sales guidelines. The first is a general sales threshhold applicable to initial orders, somewhere between $3000~4000 retail, that Diamond expects comics to meet to continue to be listed in Previews. New comics are given a few issues to reach that plateau. If the comic doesn’t, or falls below it after a few issues, Diamond will ask the series to be cancelled. While the sales threshhold is applicable to all products, this is most relevant to the concept of comics as periodical magazines; serials which have limited shelf lives. There is a lot more discussion of this subject happening on the internet here , here , and here as well. I hope you all have a nice weekend. As a kid.... I was not too crazy about Jack's work. Although I saw some cool stuff sometimes in what he did, I was much more attracted to the work of Sal Buscema, George Perez, Joe Sinnott and others at the time. Sometimes Jack would draw some cool stuff.... but sometimes..... he would do some weird stuff too. What I would fail to see at the time was that a lot of the artists that I was admiring were deriving their style from Kirby's work. Heck in some cases they would flat out copy what Jack had done before. For example I was a big fan of the FF when Rich Buckler was drawing the book and it was masterfully inked by Joe Sinnott. But little did I know at the time that Buckler would often swipe poses from Kirby. So little did I realise at the time how much Kirby's work was influencing me. By being influenced by the Bucemas, Perez, Byrne, and countless others.... I was indirectly influenced by Kirby whether I knew it at the time or not. Years later while I was working on Bob Morane, a great guy by the name of Gabriel Morisette would introduce me to the Jack Kirby Collector. Seeing Jack's pencilled work was an illumination. It was great seeing Jack's work before it was inked by someone else. I was finally able to see for myself the power in Jack's pencil. Heck often while working on Bob Morane I would draw a Jack Kirby character, then I would tweak it slightly to turn it into a Bob Morane character. Since the Bob Morane style was influenced by Bruce Timm on Batman Adventures, and Bruce Timm was influenced by Kirby, and Kirby in turn was influenced from working in animation.... understanding that.... I could use Kirby's style to help me do my work on Bob. Later I was able to see some great Kirby work like the New Gods and Mister Miracle in TPB. And other series never collected AFAIK in TPB like the Demon, Machine Man, Black Panther. I also got my hands on "the Complete Sky Masters". The mixture of Kirby's work with Wallace Wood's use of light and shading is pure magic. I would recommend it to anyone. If you can get your hands on that book.... don't hesitate. You can still see Kirby’s influence in the work of others like Darwin Cook, Bruce Timm, Mike Mignola, Steve Rude, and countless others I fail to mention. Heck even though I try to not copy his style, I do try to capture the essence of his style in my work. 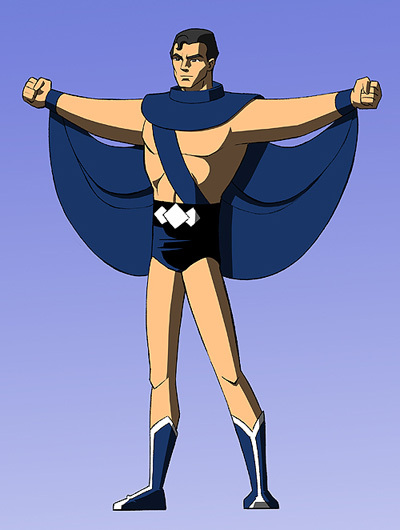 Today's Free Comic is from Spark Publications - a character named Golden Lad. Spark Publications was a short-lived comic book publisher in the mid-1940s. Most of their comics were produced by a studio run by Jerry Robinson and Mort Meskin. I recently discovered Golden Lad because of a newly scanned copy of issue 5 that was released, and I was very impressed with the art in the issue. 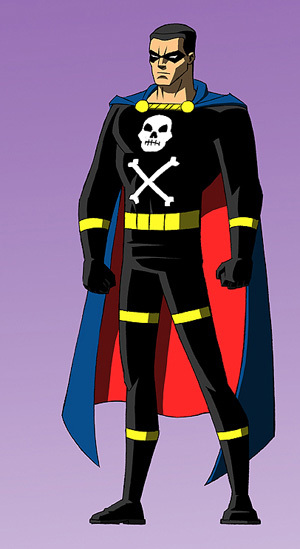 After his short run, Golden Lad disappeared except for a single story that was included in an AC Comics reprint book in 1996. 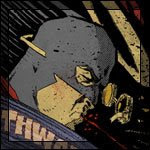 Anway, I mentioned the Wayback Universe a while back, which is our Golden Age Flashback Universe. 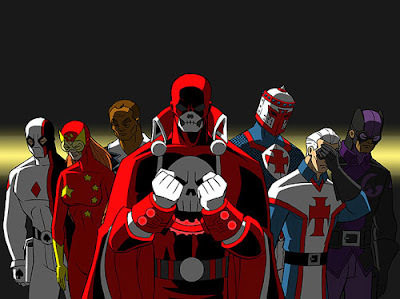 One of the characters in this universe is a guy we are calling The Red Death. He's our tip of the hat to The Black Terror. Pierre's whipped up a pretty nice costume for the character, but we are both waffling on the color scheme. Below are two images Pierre did with the character as a test. The images are from a story we are working on called The Trial of the Red Death. If anyone has a preference, please let us know. Is the art of research gone??? It seems that since.... lets say 2000 to give ourselves a round number..... it seems that many stories are poorly researched. Too often we will see a story that pretty much ignores/contradicts what has happened before. Or heck.... sometimes it ignores/contradicts what is happening at the same time. But in some cases..... those contradictions are done by the same writer. For example..... in Avengers and New Avengers the chain of events, or continuity if you prefer between both title did not match. So it is difficult to say that the problem is poor research in that case since both comics were written by the same guy. Is the problem really poor research??? Or is it something else???? Something deeper??? As I was flipping through the New Avengers: Illuminati TPB..... at first glace I saw what could be an example of both problems. But in the same issue they keep on saying/showing that Tony needs his armor to survive. 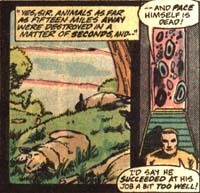 But that has not been true at the very least since Iron-Man issue #64, 1973. I am still scratching my head at that one since anyone who read Iron-Man issue #125 whould KNOW that. By then Tony no longer needed his armor to keep his heart beating. Or am I missing something?? As for the other example that seems to be more then just poor research. "I could have stopped it." "One psychic command and I could have made every one of them go to sleep." Even Galactus?? Does the writer REALLY believe that Xavier could put Galactus to sleep?? Or Ultron??? A machine?? Even with ZERO research the writer should have known that one. Or Magneto who "although he has no psionic talents, his will is second to none" (see Uncanny X-Men #125). Right there.... it is some narration from Xavier that was poorly thought out. And that is without taking into account that some like Iron-Man, Kang, and Doctor Doom most likely have some of their technology that would give them at least some protection against someone like Xavier. Heck some such technology is established for Doctor Doom in the Graphic Novel "Emperor Doom". And even without that technology, Doom's will is still strong enough to resist Zebediah Kilgrave's power. So imagine how strong his will is WITH that technology. So what really is the problem?? Or poorly thought out ideas/stories??? Can someone explain it to me as if I was 6 years old?? Although to be fair.... on the other end of the spectrum... you have writers like Busiek, Slott, Johns and others I fail to mention who seem to do their research. Who use continuity and what has happened before to weave some pretty awesome tales. Although is it really because they did their research?? Or is it simply that they remember the stories that they have read as kids or even later in their life?? I am curious to hear your thoughts on the subject. A young American struck by lightning has been hurled down to the subterranean land of Deltos. Dr. Bertof - scientist and ruler of Deltos - reviving him with injections of Radium has harnessed the power of lightning in his body. So was born the Blue Bolt. Anyway, this character was created by Joe Simon, so the artwork is top notch! Initially published by Novelty Press, Blue Bolt Comics, one of the earliest comic books titled after a single character, ran 110 issues, cover-dated June 1940 to August 1951. Its namesake hero was created by writer-artist Joe Simon for Funnies Inc., one of the earliest comic-book "packagers" that produced outsourced comics on demand for publisher entering the fledgling medium. By the second issue, Simon had enlisted Jack Kirby as the series co-writer/artist, starting the first pairing of the future comic book legends who shortly there after created Captain America and other characters. How many comics do you read a month? Is Dracula In Public Domain? How do I read a CBR File?